One vivid image of the historical relationship between government power and individual liberties in America has long been the swing of the pendulum. It catches the nature of the perpetually changing balance between the two. When it comes to terrorism and civil liberties after 9/11, that pendulum swung strongly toward the power side of the equation and it has been slow indeed to swing back. Still, in several areas in recent years — torture, detention, and surveillance — there has been at least some movement in the other direction and from this delayed and modest backswing, there is a distinct lesson to be drawn about liberty and security in twenty-first-century America. The only problem is that no one has bothered to draw it. In several government reports, the failures of both the torture and the surveillance programs to produce tangible results were repeatedly noted by experts, analysts, and officials. In the case of torture, the Senate Foreign Relations Committee, under the direction of Diane Feinstein, completed a 6,000-page report detailing the evolution of torture policy after 9/11 and its grim use on individual detainees. The report’s more than 500-page executive summary, released to the public, condemned the Bush administration’s use of torture, declaring that “CIA personnel, aided by two outside contractors, decided to initiate a program of indefinite secret detention and the use of brutal interrogation techniques in violation of U.S. law, treaty obligations, and our values.” In every instance, the report concluded, the program did not produce useful information of any sort that led in any way to the stopping of terror attacks or plots. In the words of the report, “The Committee finds, based on a review of CIA interrogation records, that the use of the CIA’s enhanced interrogation techniques was not an effective means of obtaining accurate information or gaining detainee cooperation.” If anything, those brutal techniques only alienated allies, while adding fuel to the fire of anti-American sentiment worldwide. There’s a lesson in all this that should be given some thought. When civil libertarians defend their side of the liberty-security debate, they usually claim that liberties are just as important as security. Perhaps what they should be saying is that protecting our liberties means ensuring our safety; that surveilling everyone produces more but not better information and is not a national security measure; and that the informed interrogation of prisoners who have rights, including the right to a fair trial, is not only more consonant with the American way, but more effective than secret prisons and physical abuse. Karen J. Greenberg, a TomDispatch regular, is the director of the Center on National Security at Fordham Law School and author of The Least Worst Place: Guantánamo’s First 100 Days. 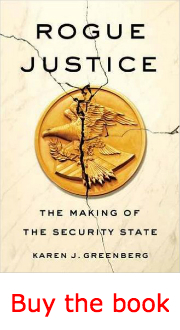 Her latest book is Rogue Justice: The Making of the Security State. Andrew Dalack contributed to this article.